1815 entire dated "Basseterre May 14th 1815" from Thomas William Sturgeon N.O. 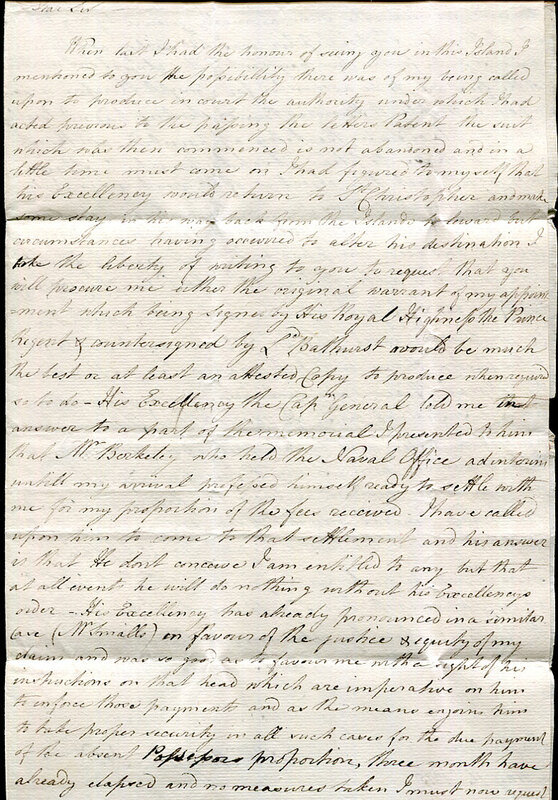 (Naval Office) to J. 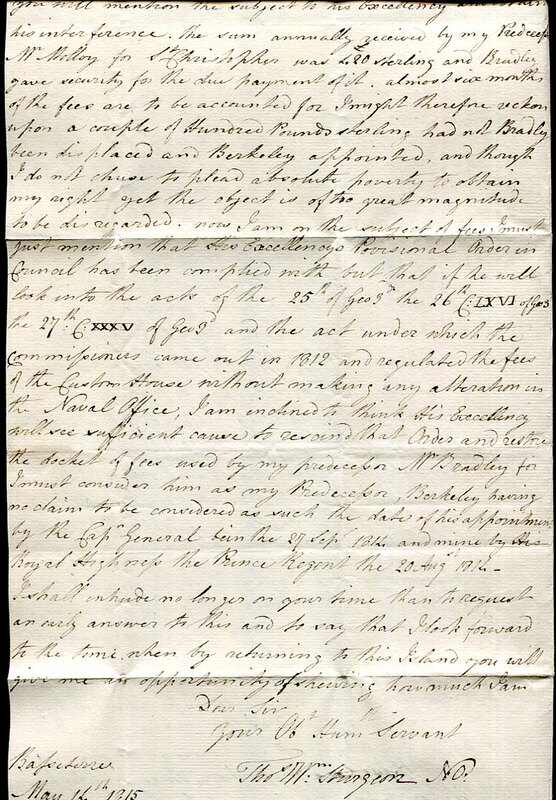 King, Secretary to His Excellency Sir, James Leith, Antigua carried through the mail as rated "4" unpaid. Docketted on lower flap "St. Christopher as requesting either the original warrant for his appointment, or copy". Fleurons used as ingoing arrival marks are by far the rarest in their group and very seldom found. 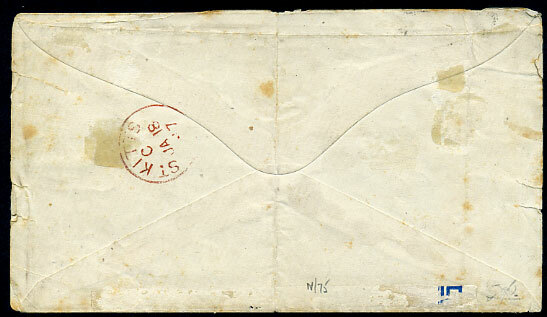 1860 cover front to Macclesfield with left flap, small portions right and lower edges irredeemably folded back and held with hinges (now browned) with GB QV 6d neatly tied "A12". 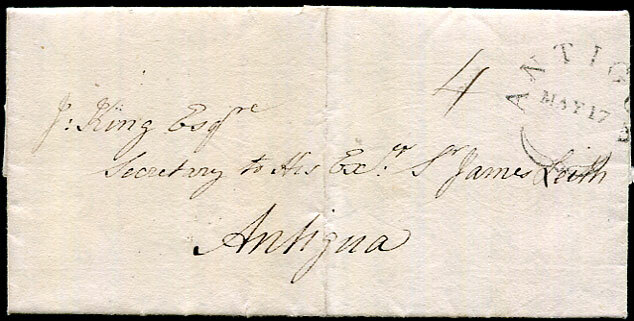 The left fold has been prized open to show ST. KITTS MR 28 1860 dbl-arc and manuscript "posted too late", no indication of arrival. Use of the GB QV 6d alone on cover at St. Christopher is must scarcer than expected, currently I only record 7 items. No attempt has been made to improve the flap but with care it could be restored. 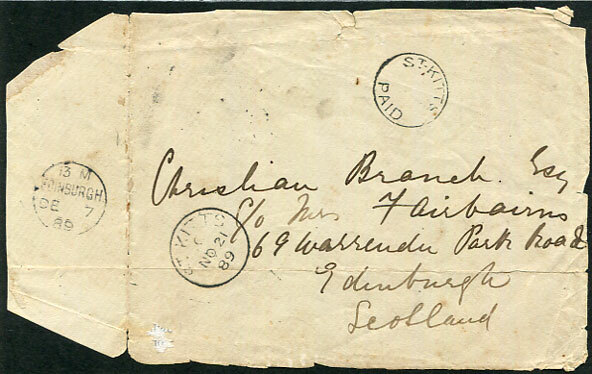 The expectation is that this "cover" was held over until the next sailing on AP 11 1860 and would have provided an interesting situation as on AP 1 1860 control of the West Indian Post Offices was officially transferred to local authorities, and GB stamps after that date were not technically permitted. 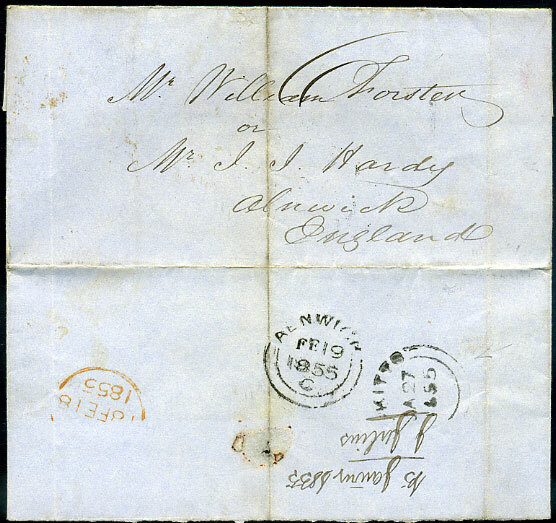 The red ST. KITTS/PAID handstamp being used until St. Christopher provided itself with their own postage stamps (first supplies invoiced FE 14 1870). Use of the red ST. KITTS/PAID on AP 11 1860 is illustrated and described Brian Brookes sale lot 148 (Spink JA 23 2018). 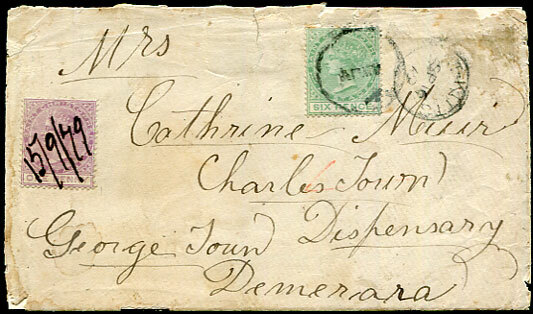 1879 cover to Cathrine Muir, Charles Town Dispensary, George Town, Demerara with QV 1d magenta pmk'd "15/9/79" at one of the rural offices with QV 6d green pmk'd APMY cds with ST. KITTS SP 16 79 despatch alongside, soiled and faulty edges, large part flap lost in opening, partial Georgetown arrival backstamp. Ex, URWICK, TV ROBERTS, BROOKES. British Guiana had an interim UPU rate AP 1 77 to AP 1 79 and during that period mail from St. Christopher (as a non-UPU member) would have been 6d. At the time of posting this letter both would have been full UPU members (St. Christopher having joined the UPU JY 1 1879) and postage should have been 4d. However there must have been confusion on the part of St. Christopher as the rural 1d surcharge was contrary to UPU regulations, and it is felt that the continued use of the 6d rate, ten weeks after joining, was an overhang. 1884 OHMS inscribed foolscap cover to Freshford, Near Bath, Somersetshire with QV 4d blue pair, 6d green tied "A12" (with further 6d stamp removed to make the 5 x 4d quintuple rate) pmk'd ST. KITTS C/SP 26 84, backstamped Bath (OC 13) and Freshford (OC 12). Both stamps and cover edges with faults. 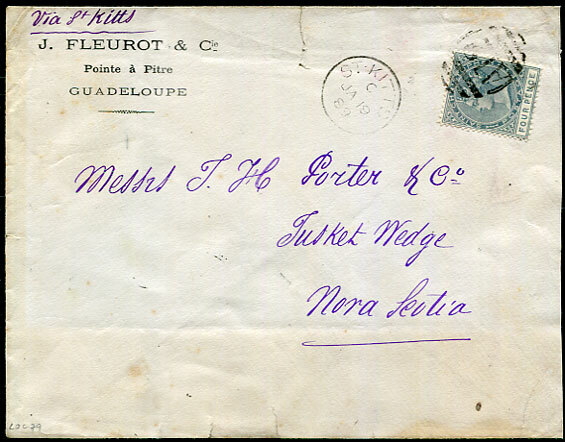 1889 cover from J. Fleurot & Cie, Pointe a Pitre, Guadeloupe to J.H. Porter & Co., Tusket Wedge, Nova Scotia carried privately to St. Kitts and posted with QV 4d grey tied "A12" with C/JA 19 89 despatch, light part YARMOUTH N.S. FE 6 89 transit on reverse. Small tear at top and other peripheral faults but the only cover recorded as such. ST. KITTS PAID used during shortage 4d stamps for UPU rate to SCOTLAND. 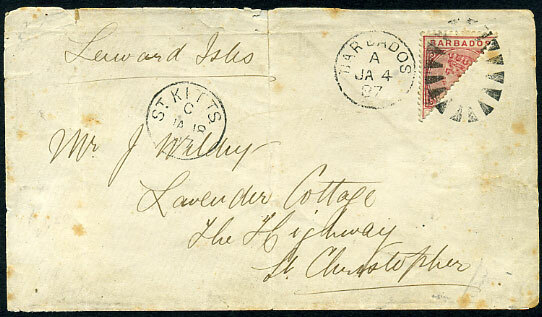 1889 stampless cover front with single flap to Edinburgh with the (4d) UPU rate covered by black undated ST. KITTS PAID with ST. KITTS C/NO 21 89 despatch showing DE 7 89 arrival on opened flap. Fragile with horiz. crease and edge faults mounted against black background sharing the earliest known use date. Ex FORSYTH, BROOKES. The 1889 shortage of ½d, 1d, 2½d, 4d stamps currently spans a 22 day period NO 21 1889 to DE 12 1889. New supplies were invoiced NO 29 1889 comprising ½d dull green (6,080 stamps), 1d carmine-rose, 2½d ultramarine, 4d grey (6,100 each) all Crown CA wmk, with expected arrival in time for the DE 19 89 sailing to UK. Only four covers and two cover fronts are recorded comprising NO 21 89 (at the over 300 miles rate) to Trinidad, NO 21 89 and DE 5 89 cover fronts (at the 4d UPU rate) to Edinburgh and London respectively, DE 5 89 and DE 12 89 (at the 2½d under 300 miles radius rate) to Barbados and Antigua respectively, and DE 10 89 (at the 1d local rate) to Nevis. ST. KITTS PAID (used during shortage 4d stamps for UPU rate) to ENGLAND. 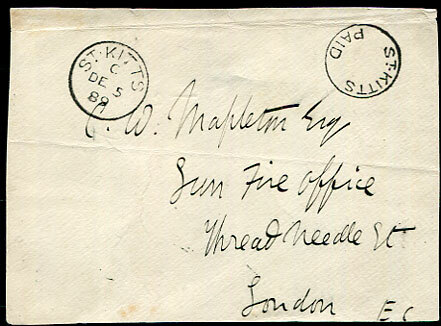 1889 stampless reduced cover front to London with the (4d) UPU rate covered by black undated ST. KITTS PAID with ST. KITTS C/DE 5 89 despatch. Ex URWICK, BROOKES. double-arc dated JA 27 1855 on 6d rated wrapper to Alnwick. the bogus "Revenue" and "HALF PENNY" overprints on diagonally perforated genuine QV 1d carmine (SG.92) tied faked Barbados duplex A/JA 4 87 on cover to St. Christopher showing both red and black faked arrival cancels. Opened-out for display, a little fragile with small faults, only entire seen as such. BPA cert as faked cover.